So, you’ve found yourself in London for the weekend! …and clearly you’re looking for things to do, or you wouldn’t be here, would you? Well, here’s some inside knowledge combined with some tourist hotspots of the city to put together a top-notch guide for you. It won’t be as fast paced as the guy who tried to beat the Tube and you won’t quite be undertaking the Tube Challenge but we promise that this ultimate, whistle-stop tour of the city will provide you with some of the best that London has to offer. First things first, you’ll need to find somewhere to stay. This 48 hours might be jam-packed but you’ll definitely need a good night’s sleep in the middle. 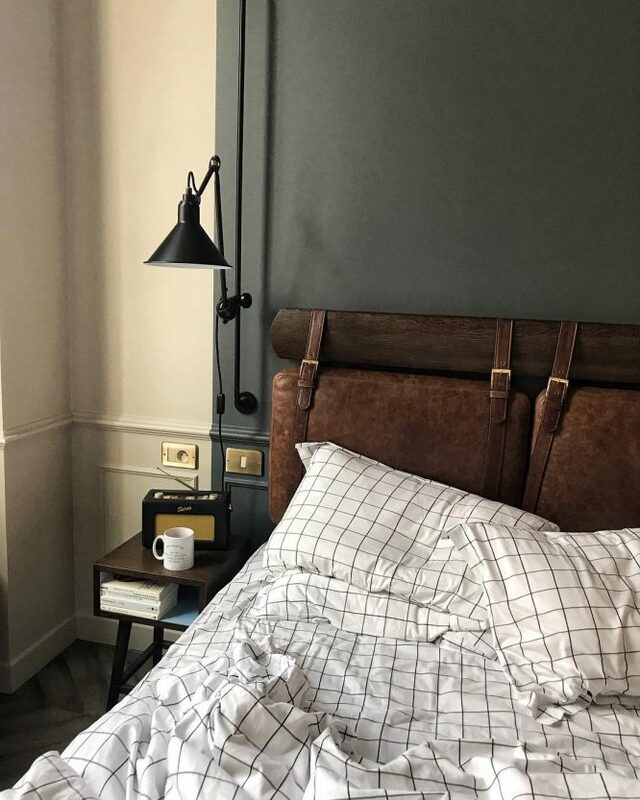 There are any number of gorgeous hotels in the capital but one of our favourites, recommended by multiple members of the Secret London team, is The Hoxton in Shoreditch. Centrally located and plumped up with beautiful artworks and greenery, you’ll be close enough to the action without falling asleep to the sound of the main roads. And when it comes to getting around the city, the Tube and bus system will be your best friends. You could spend upwards of £30 on an official sightseeing bus, or you could save yourself around £25 and hop on/hop off the public transport system. Start your day by heading to Kensington for a burst of culture. 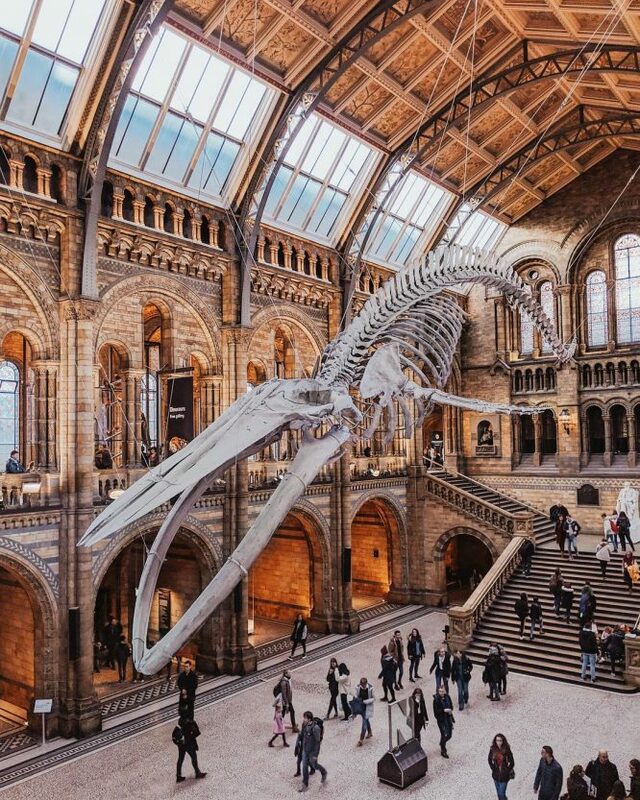 You’ll be able to museum-hop til your heart’s content at the likes of the Natural History Museum, the Science Museum and The Victoria & Albert. Unless you’re prepared to devote the entirety of one of your precious days looking at artefacts, we recommend admiring the latter two from a distance and focusing on the (free to enter) Natural History Museum. Pop into Hintze Hall to wave hi to Hope the Whale and spend a few hours gazing at dinosaurs, earthquakes and more. Or, if you’d rather throw a spanner in the works and admire a different type of culture, check out our full list here. You’ll probably want to stop for lunch by now, so either walk for 18 minutes or catch the Piccadilly line to Piccadilly Circus for a spot of lunch at Ikoyi. This west African restaurant combines unusual ingredients with bold heat and umami to produce a limited but undeniably delicious menu. It’s been called “one of the most innovative and original restaurants” in the city and you’ll leave not stuffed, but comfortably full. South Kensington is a lovely area, so spend some time wandering around before making your way up to Buckingham Palace. If the weather’s nice, take the scenic route up past Hyde Park, or if it’s as quintessentially British (read: gloomy) as ever, the Piccadilly line eastbound is your friend. 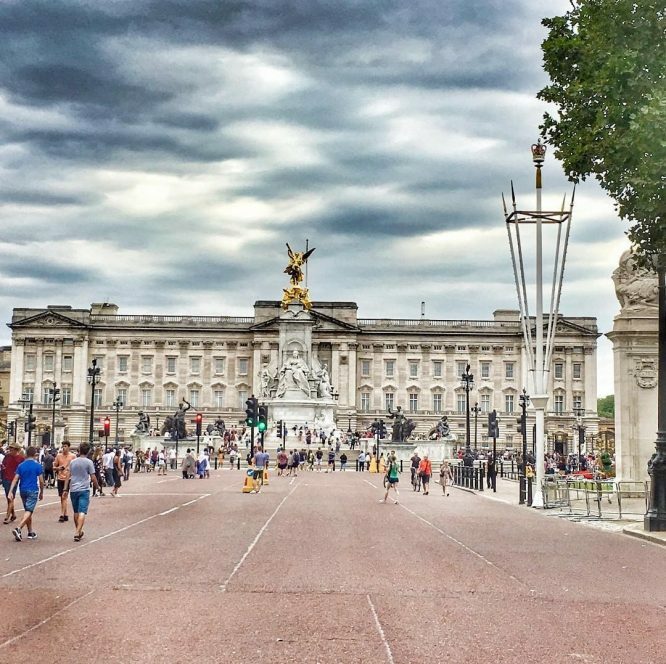 Get off at Green Park station and you’ll find the palace only a few minute’s walk away. During the summer you can come inside and explore the 19 State Rooms, but even during winter it’s worth dropping by to tick it off your London bucket-list. If you hadn’t noticed, we’re almost by Covent Garden and the surrounding theatre district. And it wouldn’t be a whistlestop tour of London without going to watch a West End show. 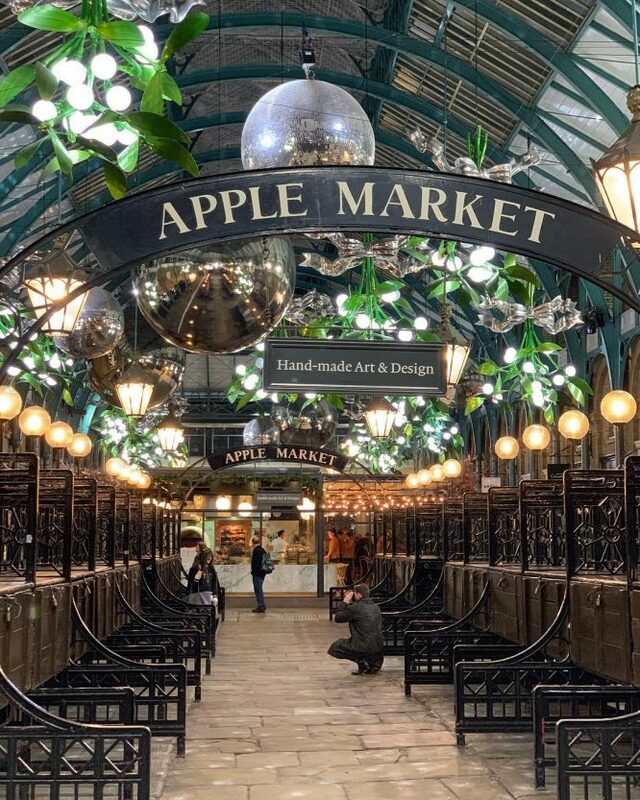 But beforehand, explore Covent Garden market’s many stalls of trinkets and goodies. Then, wander out to the main square to watch buskers dance, sing and conduct magic tricks to the crowds. While it’s still light outside, take the opportunity to walk through the market and down towards Embankment. We’ll be covering the other side of the river in more detail tomorrow but, for the time being, snap a few shots of the sunset over the water. 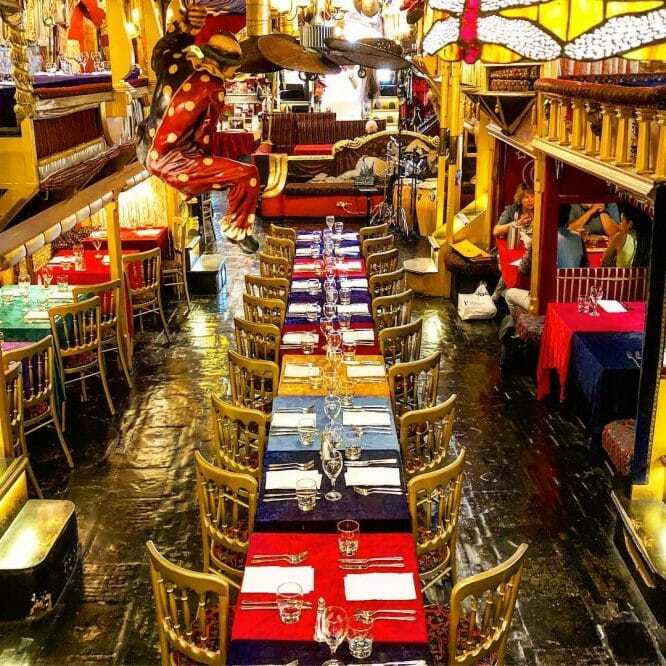 Spend your first evening in London at Sarastro, a madcap fancy restaurant filled to the brim with old theatre props. 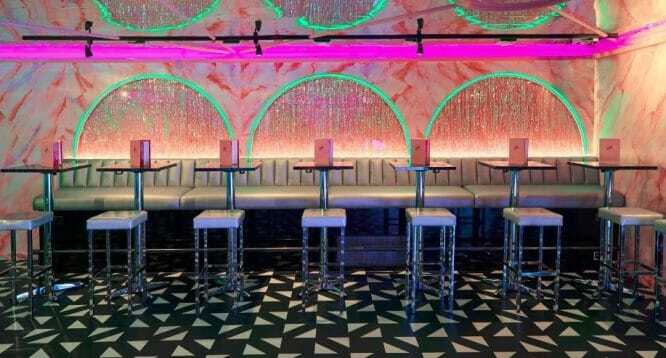 This deliciously OTT restaurant boasts an array of barmy decorations and a flair for the flamboyant. We can promise you this: dinner here will be a memorable experience. Ask for the “Tenor” menu for a slightly cheaper way to enjoy these Turkish picks, and get yourself ready for a night at the theatre. Finally it’s time to head to the theatre! 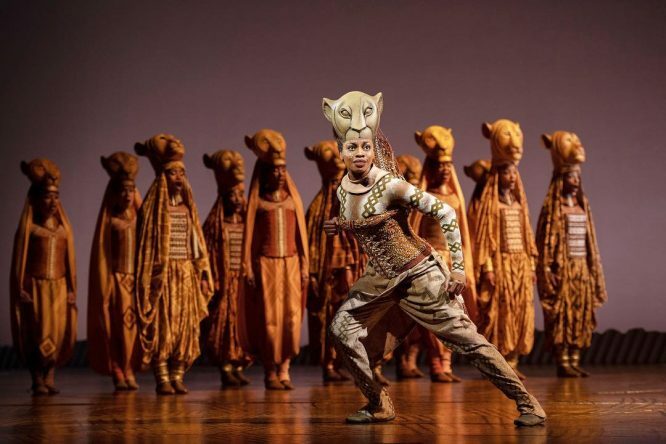 Between The Lion King and The Book of Mormon, Mary Poppins and Motown, there’s plenty to choose from. Have a look at some of the top shows on Fever to see what’s available on your selected night, and get yourself ready for an evening of culture. As they say, breakfast is the most important meal of the day and you’ll definitely want to start day two of your visit with a full stomach. Luckily, London knows how to do a good breakfast no matter what you’re craving. We’ll be exploring east London today, so let’s start somewhere in the middle: Duck and Waffle. 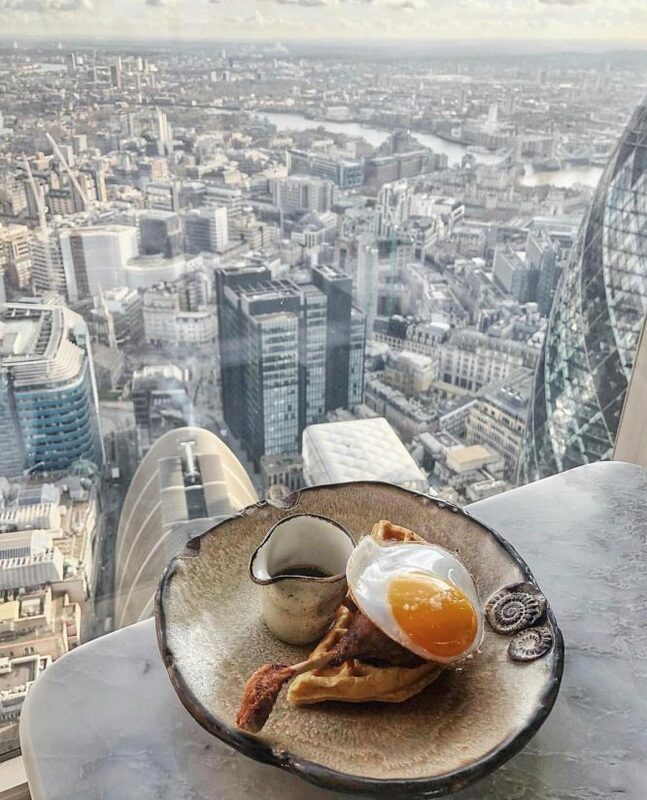 It’s only a 16 minute walk from The Hoxton to this top notch breakfast spot, where you’ll be whipped up 40 floors into the skyline. It combines two things we love the most: Instagrammable views and delicious brunch foods. Book in advance, because Duck and Waffle sells out quickly, and go for one of the savoury waffles when you arrive. It’s time to explore east London’s infamous Brick Lane – filled with all things unique and delicious. We love Brick Lane so much that we’ve written about it many times before and you can easily spend a few hours exploring the area. 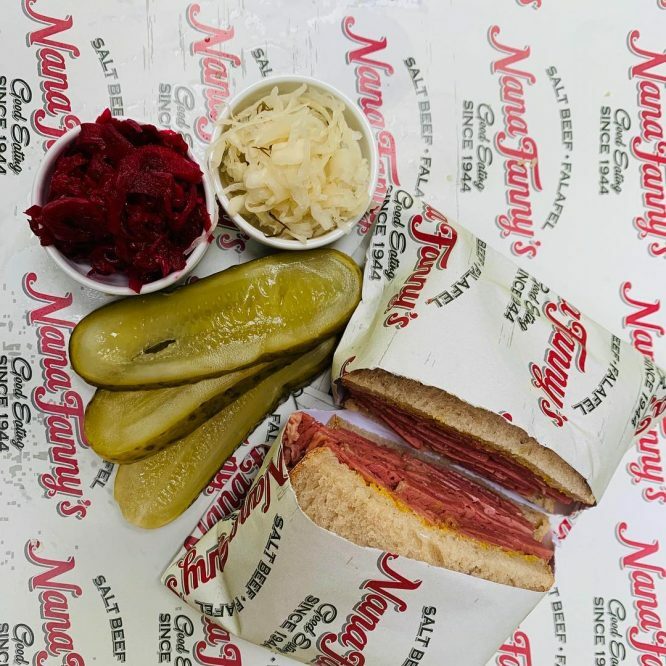 Try some famous salt-beef if you’re not stuffed from breakfast and wander up and down the markets to hunt down some unusual souvenirs. There are also plenty of vintage stalls where you can pick out some bargain garbs to take home with you. While you’re there, keep an eye out for these lovely street-art limericks. We’ll save you a walk when you decide it’s time for lunch, because it’s difficult to walk around the area without being tempted by various street food stalls. Try some incredible fried chicken, Bangladeshi sweets, fresh fruit juices and more. It’s time for some more culture, but today’s focused on art rather than history or theatre. 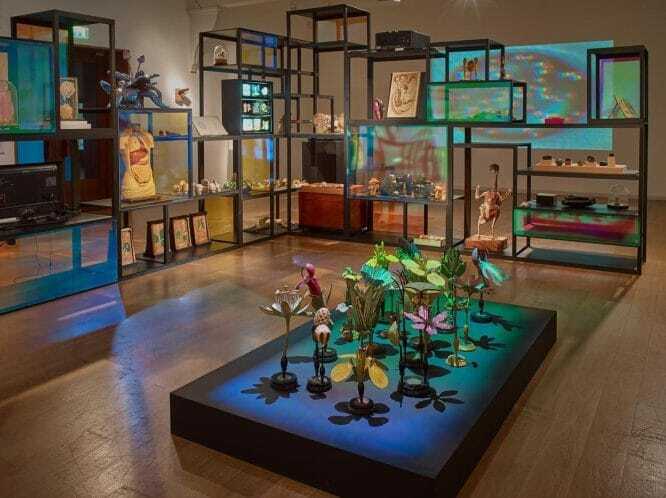 Whitechapel Gallery is one of the favourites in the area, and has premiered artists like Pablo Picasso, Jackson Pollock, Mark Rothko and Frida Kahlo. You’ll also find lots of other exhibitions with worldwide influences. Give yourself an hour or so to explore the gallery before catching the District line from Aldgate East station over to Monument. Then, walk four minutes up the road to the Sky Garden. It’s another spot you’ll need to pre-book but it has the luxury of being free. 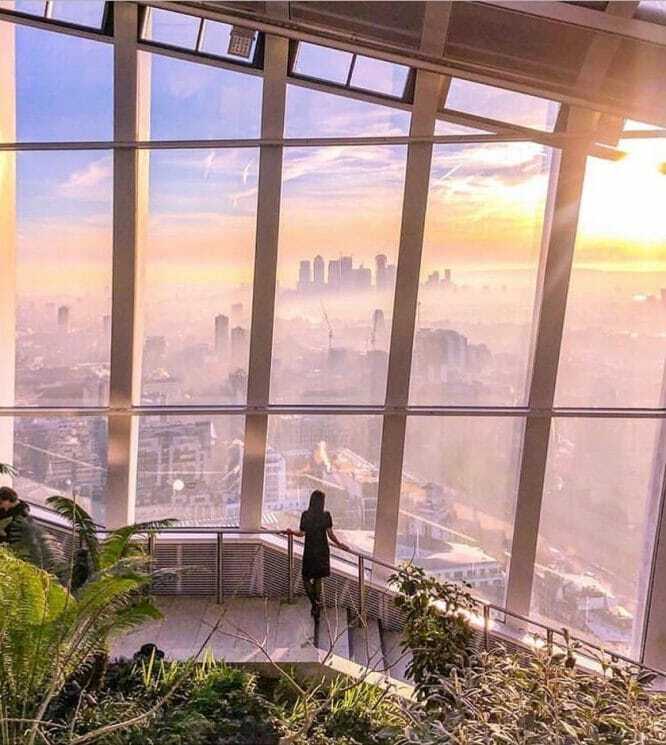 Reserve your date and time a few weeks in advance to be able to shoot up 72 floors to the green goodness that is 20 Fenchurch Street. Explore the garden and order a cocktail for a brief spot of serenity in the middle of the city. Then, it’s back on the District line for one last spot of unforgettable art in London: the Tate modern. Consider this your brief stint in south London and one that shouldn’t be missed. Get the 344 bus from Fenchurch Street (Stop U) for a scenic drive over the Southwark bridge. Admire the views of the water before getting off at the Bankside Pier stop and walking five minutes up the road to the Tate Modern. You’ll probably want around two hours to explore all of the exhibitions, and don’t forget to visit the top floor for some more impressive views. All art-ed out yet? By now, it’s probably getting dark, so hang around by the South Bank to enjoy the sunset. 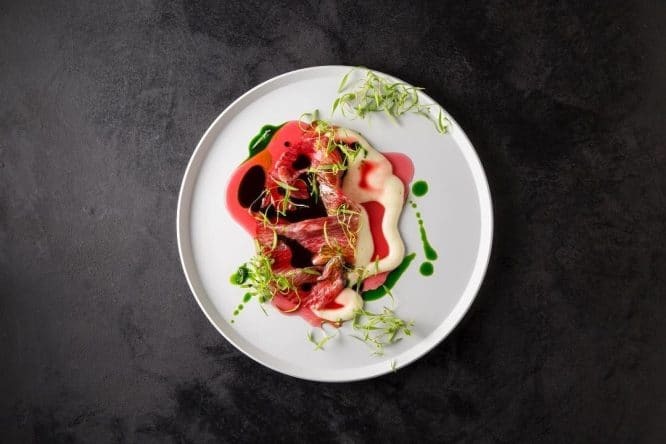 You’ll find Baltic restaurant & bar an eight minute walk straight up the road towards Southwark station or have a browse through these equally delicious spots. 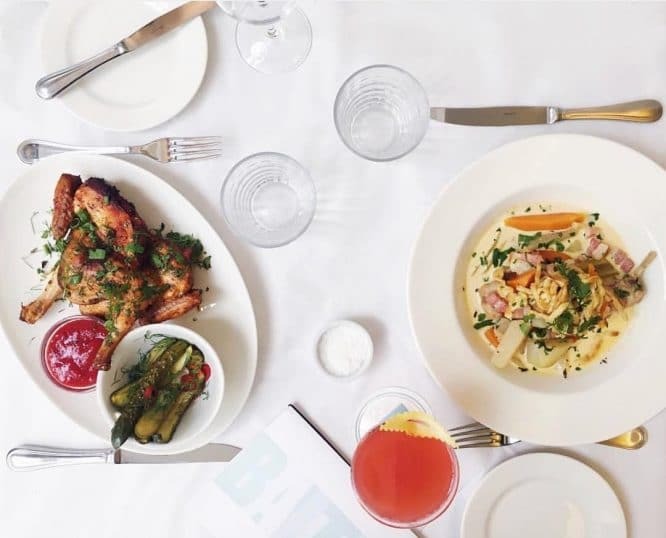 Based in a converted carriage works in Waterloo, feast upon some delicious eastern European delicacies at Baltic for a real flavour adventure. On the menu, choose between Polish classics like Potato, Cheese and Spring Onion Pierogi or a Siberian Pelmeni (small veal and pork dumplings). If you’re feeling adventurous, pick something like the Choucroute of Golonka or the Braised Rabbit Leg. Before you turn in for the night, head back to east London (Jubilee line from Southwark to London Bridge and then Northern to Old Street) for a few drinks. We’ve listed some of our favourites here, but we’d especially recommend Tonight Josephine, London’s perfectly pink cocktail bar. For £16, you’ll get three cocktails (and we don’t need to tell you that that’s a bargain for central London). Between the glittering pink walls, mirror ceilings, and the red roses adorning Tonight Josephine’s ‘Lady Garden’, the whole place is an Instagrammer’s paradise. The sweet-sounding No Time For Napoleon is served with a macaroon on top, and the Midnight Flower blends gin, pineapple juice, and lavender syrup. Catching the eye, however, is the Flaming Zombie. Not for the faint of heart! And that concludes your 48 hours in London. Got extra time in the city, or want some more recommendations? Keep checking back at Secret London for our top tips. This post was originally published at Secret London. 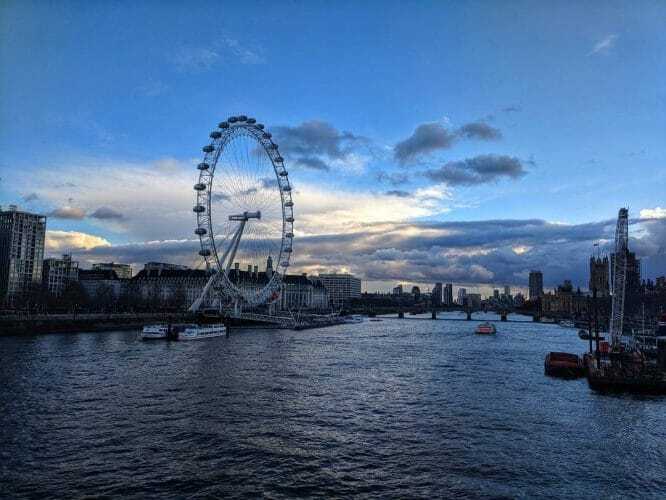 Posted on April 9, 2019 by Georgie DarlingPosted in City Breaks, europeTagged 48 hours, AirBnb, city break, england, london, mini break, secret london, solo female travel, solo travel, the shard, things to do, time out, travel, travel blogger, what's on in london.